Animal organs. Digestive system. Tooth. Atlas of plant and animal histology. Technique: decalcification, paraffin embedding, and haemaotxylin-eosin staining. Teeth are found in the oral cavity and are needed to tear and crush the food. Teeth are fixed to the upper (maxilla) and lower jaws, inserted in the alveolar processes by the teeth roots. Position and form determine the name given to each tooth. In adult humans, there are 2 central incisors, 2 lateral incisors, 2 canines, 4 premolars, and 6 molars, in each jaw. They perform different roles during feeding. For instance, tearing by incisors and crushing by molars. In humans, 6 months after birth, milk teething appears with 20 teeth, which are replaced by permanent teeth at the age of 6 to 13. Macroscopically, the root is the hidden part of the tooth, inserted in the bone alveoli, and the crown is the visible part. Incisors, canines and premolars, besides the first upper premolar, have only one root. Molars have a triple root, and some time quadruple root. The joining area between root and corona is known as neck. Microscopically, teeth show several layers containing special set of molecules that provide different hardness. The enamel is a mineralized layer that covers the tooth crown. It can not be repaired by tooth tissues because this layer is originated once and it is not renewed. It is the only mineralized structure not produced by the connective tissue, but by epithelium. Enamel is regarded as the hardest structure of the tooth, caused by a 99 % of crystalline calcium phosphate known as hydroxyapatite. Enamel is thicker in those areas of the tooth with crashing functions, up to 2.5 mm in humans. There is no enamel in the tooth root. The cementum is a layer of mineral substance, similar to bone, covering the tooth root. However, unlike the bone, it lacks blood vessels. Cementum fixes the tooth to the alveolar wall by a set of collagen fibrils, known as Sharpey fibers, that anchorage the root to the bone. These collagen fibers are set obliquely from the cementum to the inserting point in the bone. The fibrous area where these fibers are inserted forms a layer referred as periodontal membrane, which is strongly irrigated by blood vessels and innervated by nerves coming from several sources. Dentin is a calcified material constituting most of the inner part of the tooth. It is found immediately below the enamel and the cementum, and composed of about 80 % of hydroxyapatite, lower proportion than in the enamel, but higher than in the cementum and bone. Dentin leaves an inner cavity containing connective tissue. This space is called pulp. Dentin does not contain cells and it is synthesized by the odontoblasts, columnar cells that form one-cell thick layer separating dentin and pulp. 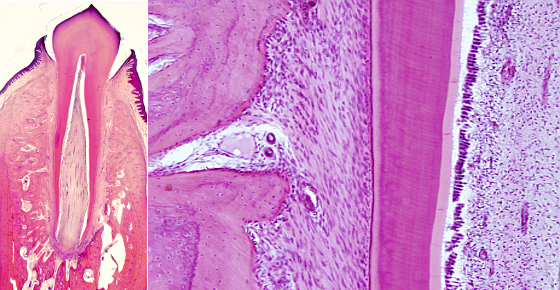 The striations observed in the dentin, in tooth histological sections, are caused by material secreted in waves by odontoblasts. At higher magnifications, dentin shows many little channels arranged radially, which are the spaces where the odontablast cytoplasm extensions were located during the release of dentin material. There is an inner region where the odontoblats start releasing non-mineralized organic material known as predentin. Pulp is loose conective tissue highly irrigated by blood vessels and densely innervated by nerves. Pulp is confined in a tooth cavity delimited by dentine. Both blood vessels and nerves enter the tooth through openings located in the tips of tooth roots known as root-end openings. Pulp looks like embryionary mesenchyma with many star-like fibroblasts and abundant ground substance.